Leave an imprint in the memory of your guests by bringing an experienced, personable, certified bartender or flair bartender to your party. Arizona Event Catering only selects the finest bartenders for your event by picking from some of the valley's finest bars, restaurants and clubs. 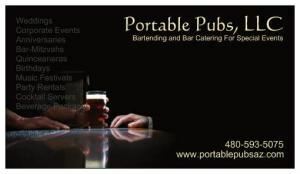 Our bartenders have a minimum of 2 years of experience in a professional, high paced setting. As well, our bartenders are certified by the Arizona State Liquor Board and Health Department which assures that your guests will be served responsibly. Working hundreds of private parties in the Phoenix valley, Tuscon, Payson, San Diego and LA for over four years now, we look forward to adding your event to our growing list.